I researched it online and it may be because the sirens mimic a dog’s howling noise. That makes sense; it does somewhat sound like a howl. So that makes sense, but why do they howl? Apparently wolves and dogs howl in order to communicate (long-distance) with their fellow canines. They might also do it when they’re lonely. That’s kind of cute. Now we can feel a little less annoyed since they are probably howling at the sirens because they think it’s another dog, not because they just want to annoy us by mimicking the siren or anything like that. I seriously loved Katy Perry’s new music video (and the song too!). It has a great retro feel and as my boyfriend says, it “is a great tribute to the 80’s.”Although the entire video is around 10 minutes, I ended up watching the “mini-movie” for at least 4 times! That’s at least 40 minutes of me watching Katy Perry’s video, lol! My favorite food is sushi. 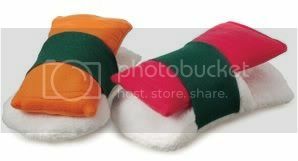 Would I would sushi slippers? Hmm, probably not. But if someone gave it to me as a gift I would find it very amusing and maybe a sweet gesture since they would have to know I’m a sushi addict Mmmmm, those slippers look like salmon and tuna nigiri. *drool* Come to think of it, maybe I would appreciate it even more if someone bought me sushi instead of inedible slippers. Lol! I’m such a glutton. So…how creepy would this be if you saw someone with this face??? Brilliant makeup. I’d love to see someone replicate this look (don’t forget to take pics and show me!). That “puffy” eye must be a bit annoying though (no more vision through that eye!). Click the image for a tutorial on how to achieve this look.